Uniting music fashion and art on stage. 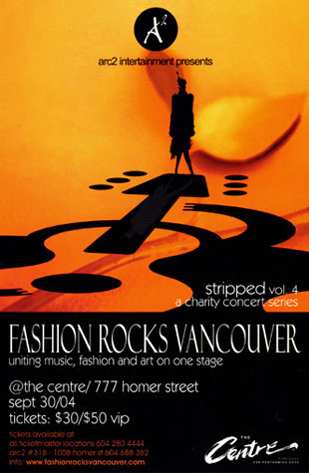 On September 30th 2004 Arc 2 Intertainment is bringing Vancouver an experience that will celebrate our distinctiveness, as well as our Canadian talent and beauty at " the Centre in Vancouver for the performing arts"
This community event will entertain and bring together all the individuals that live here, as Arc 2 combines a visual feast of fashion with a symphonic indulgence of vocals and instruments. Not just a runway show. Not just a concert. This formal occasion is aimed to recognize the designers, artists and musicians, who devote so much to there art, as well as give back to the community.